Shane Abbess' highly anticipated space opera throwback The Osiris Child sees release October 6. Abbess, whose last films Infini and Gabriel were both visual stunners delivers another impressive genre film on a tight budget. Prison planets, high-flying dogfights, monsters and madmen, the film is a fun sci-fi romp with rich characters at its core. The film stars Kellan Lutz (Twilight, Expendables 3) who has been doing some pretty interesting projects lately. Besides working with Abbess, Lutz recently worked with Blomkamp on the next Oats Studios short, Lima, as well as with John Travolta in the film Cigarette. I got Lutz on the phone to chat about the film and what drew him to the project, and also what its like for an actor to put himself in the mercy of an ambitious sci-fi film. Remember to check out our other interviews on Soundcloud. 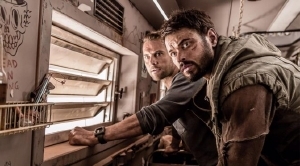 Osiris Child also stars Daniel MacPherson (The Shannara Chronicles), Isabel Lucas (Transformers: Revenge of the Fallen), Temuera Morrison (Star Wars: Revenge of the Sith), with Rachel Griffiths (Hacksaw Ridge) and Teagan Croft, making her feature film debut. RLJ Entertainment’s Ward and Jess De Leo negotiated the deal with XYZ Film’s Co-Founder Nate Bolotin on behalf of the filmmakers.